Winter is coming and we're serious about keeping farmers market produce on the menu. 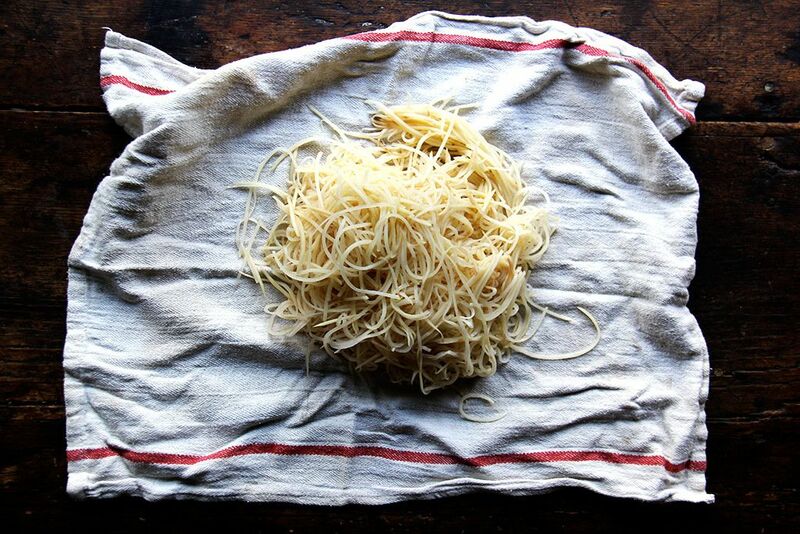 Alexandra Stafford of Alexandra Cooks shows us how to store, prep, and make the most of it, without wasting a scrap. 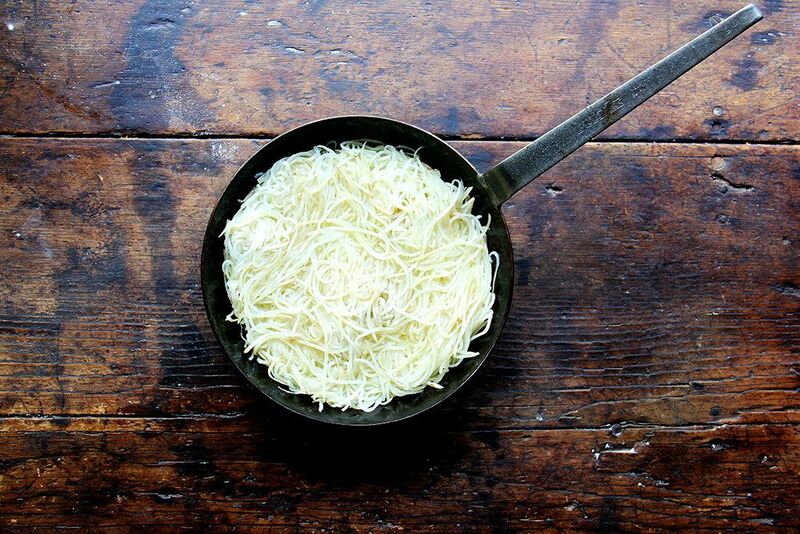 Today: Too often overlooked in a world of more beautiful vegetables, potatoes deserve to be shown off, starting with this Rösti. Grate. Press. Fry. Flip. Fry. Making potato rösti sounded simple enough. 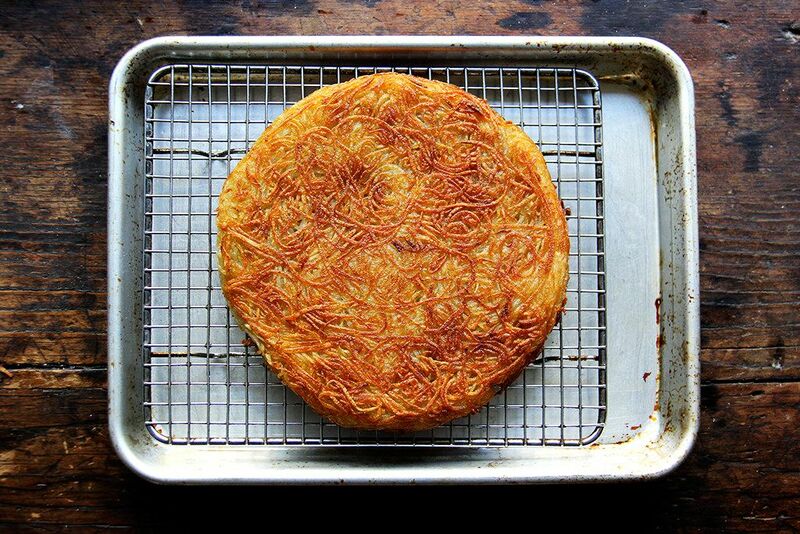 It turns out that peeking under an 8-inch wide potato pancake isn’t so easy. And flipping it is another story altogether. Two too many burnt-centered, mangled rösti had me dreaming about see-through skillets, ones with fog-free technology to boot. Determined to get it right -- a photo of a beautifully golden tangle of potatoes in the I Love New York cookbook a constant inspiration -- I decided to change my strategy. I stopped wishing for that see-through pan and mustered a little patience, faith, and finesse. Patience: Keeping the skillet at a medium-low temperature will allow for even browning and a crisp edge. As long as you can hear the oil gently sizzling, you’re on the right track. Faith: After 15 minutes of cooking at a low temperature in a generous amount of oil (requisite for rösti making), the pancake will release from the skillet without leaving more than a strand or two behind. Really, it will. Finesse: Flipping the pancake with a spatula proved as difficult as attempting to flip it fried-egg style with a nimble jerk of the wrist. The solution? Place a plate just smaller in diameter than your sauté pan over the potatoes; using one hand to secure the plate to the potatoes, flip the pan with your other hand so the pancake turns out onto the plate; slide the pancake back into the pan. 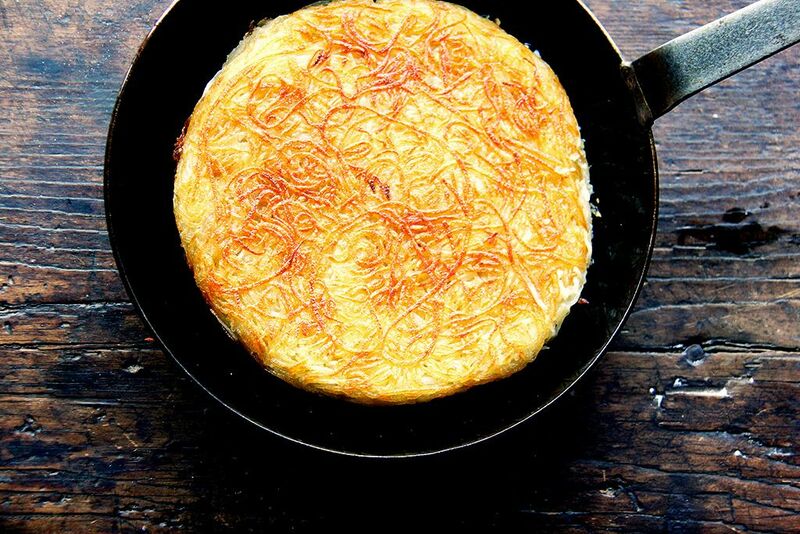 Rösti, the Swiss version of a giant potato latke, is traditionally served at breakfast. 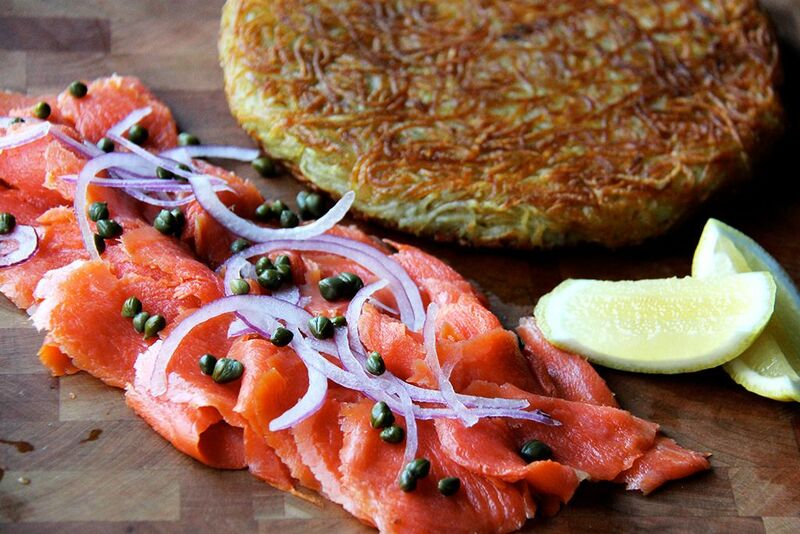 Inspired by the I Love New York cookbook, which serves their rösti with maple-smoked sturgeon, I’ve used smoked salmon here. A dollop of crème fraîche, a squeeze of lemon, and a scattering of capers and onions complete the meal -- a simple supper, an elaborate brunch. The season of gratins and mashes and soups is upon us. My only hope is that this season will be one of röstis, too. Potatoes store beautifully in a cool, dark place such as a brown paper bag tucked in your pantry or cupboard. Do not refrigerate potatoes, or at least, do not refrigerate potatoes for extended periods of time -- the starch will turn to sugar and adversely affect the flavor. Potatoes do not have to be peeled before cooking, but if you notice any green in the skin or flesh, cut off that portion and discard. Eyes can be left alone, but if the eyes have started to sprout, simply cut off the sprouts and discard. Potatoes can be dirty, so if you are not peeling, run them under cold water and scrub them with a vegetable brush to remove any dirt. If you are peeling them, and if the potatoes will be sitting for any period of time before cooking, place them in cold water, which will prevent browning. Be sure to dry potatoes well before roasting or frying. Where to begin? There are countless ways to cook potatoes, but this time of year, especially if you are buying potatoes at farmers markets, receiving them in your CSA, or harvesting your own, simple preparations are best: Dice or thinly slice; toss with olive oil, salt, and pepper; and roast until golden. Or boil them until tender, mash with lots of olive oil, salt, and chives -- this is particularly good with small, red-skinned potatoes (no need to peel). Of course, because potatoes vary in starch content, certain potatoes are better suited for certain preparations. Russets, high in starch, are prized for baking and frying, and are a good choice for making slap fries or elegant stacks of potato dominoes (though I've made these with Keuka Golds, and they couldn't have been more delicious.) 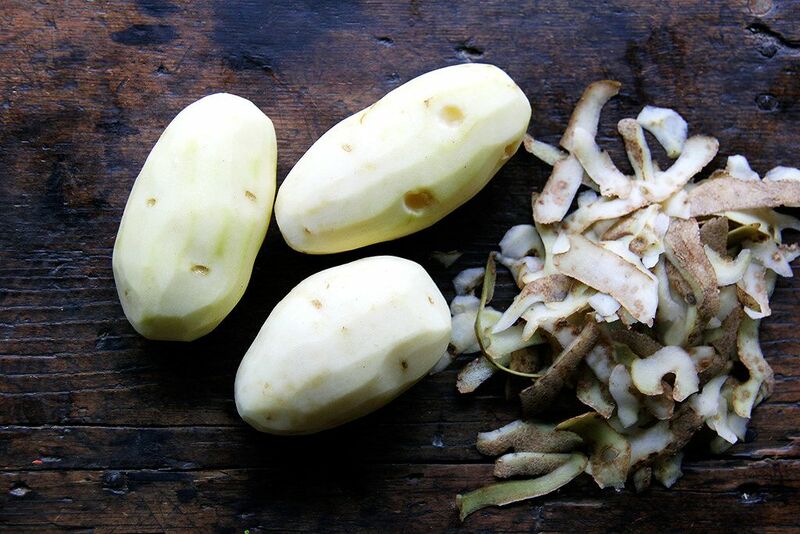 Russets are also great for hash browns, rösti, and mashes, though Yukon Golds make great mashed potatoes as well. Fingerlings can be simply roasted (left whole if small or halved if larger), but when treated a little differently -- boiled with salt in a wide shallow pan or boiled, smashed, and then fried -- make irresistible appetizers. New potatoes need little more than a browning in butter and a showering of parsley. White potatoes, Yellow Finns, or red-skinned potatoes are great in gratins and Spanish tortillas. 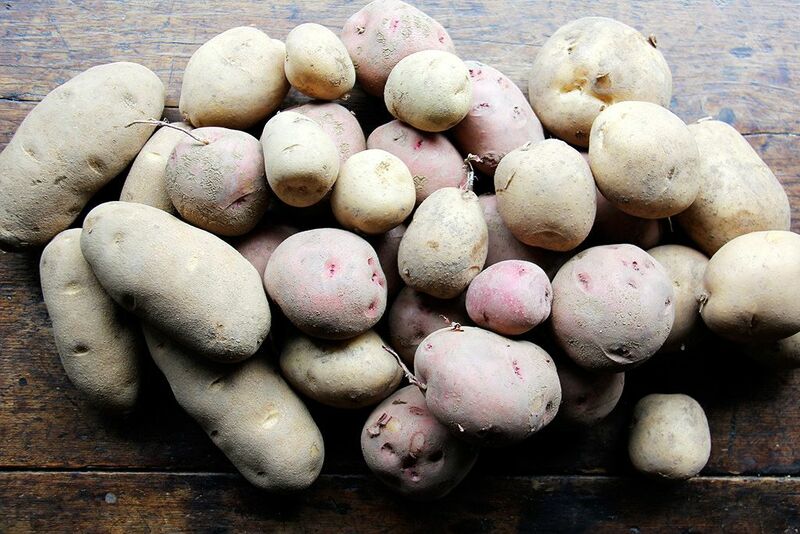 And although certain potatoes fare better with certain preparations, a variety of potatoes can be used for countless preparations: salad, pizza, soup, stew, pierogi, and gnocchi. Yum! Definitely want to make this soon! (For the first time, I have a big bag of potatoes in the cabinet, since my boyfriend is obsessed with your baked fries, and he requests them regularly!) But I have a silly question - I've never purchased smoked salmon before, but it looks like it's a perfect combo here. Is there a particular kind you'd recommend, or anything in particular I should look for? 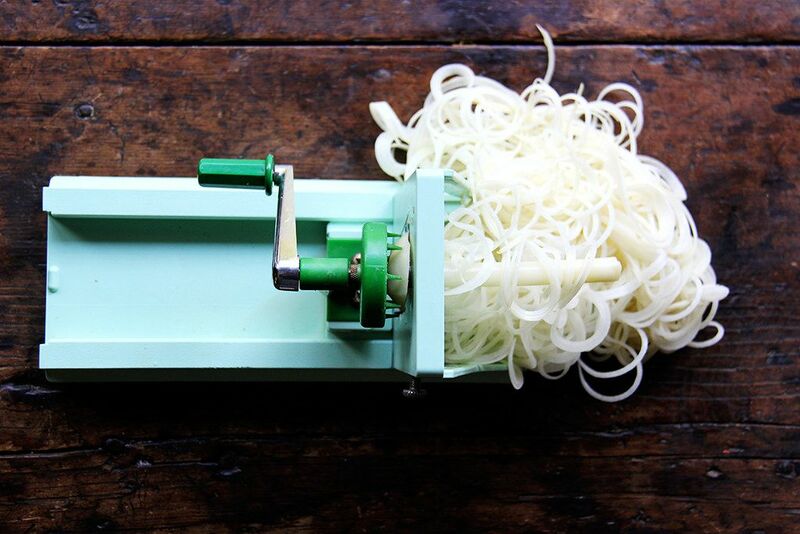 In this recipe you picture a spiral vegetable cutter (green). Have checked your provisions site and many others and cannot find it. Even if it was a photo prop. could you provide the manuafacture or a source. I can only find plastic units and this one looks metal and more substantial to handle cutting the density of potatoes. Thanks in advance. I bought that turning slicer years ago when I lived in Philadelphia. The shop was called Fante's. Here is a link to the product: http://www.fantes.com/benriner-horizontal-turning-slicer.html It looks exactly the same as when I bought it about ten years ago. You might be able to find a better price elsewhere on line. It is plastic, but it works well. I also have the benriner mandoline, which is also plastic, but I love its simple design and that it is so light weight and can be easily stowed, etc. I'm drooling. 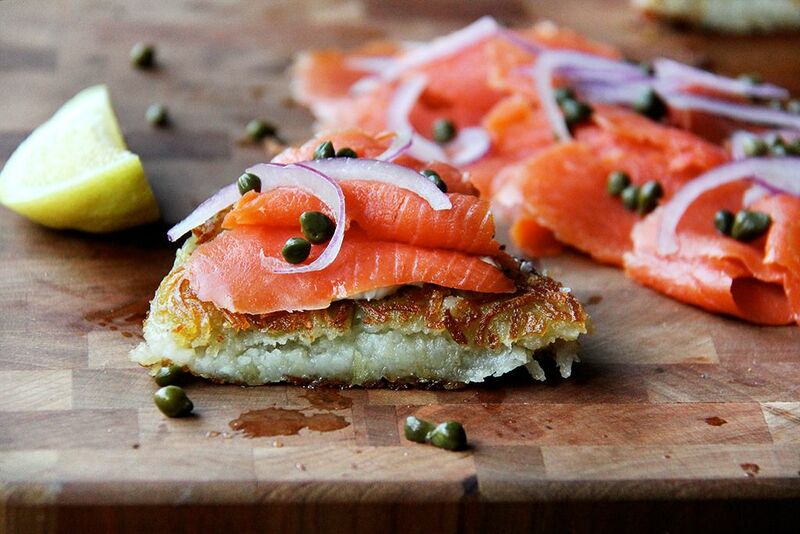 Seriously, the combination of salmon, lemon, capers, creme fraiche w/that crunchy potato texture sends me. Can't wait to make, thank you!! I'm afraid my sources extended to the internet on that one, so thank you for clarfifying. 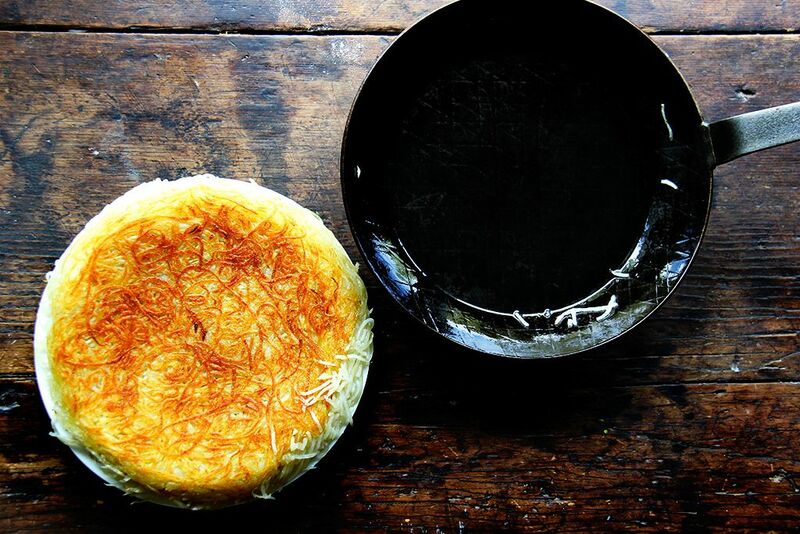 Is it possible that rosti once, many years ago, was served for breakfast? That was my impression from what I read online, though I have learned over the years these souces can be unreliable. Thanks for writing in! I lived in Basel, Switzerland, they are cooking the unpeeled potatoes the night before and let it cool over night. Next day peeled and grated, they always browned a bit of fine grated onion under the potatoes, and seasoned it with Knor Aromat - lately I do not find it in Toronto. There is a version when they brown julienne-d ham end mix it into the potatoes before browning. That version called Vincer Rosti, fried egg is great to it. Hi Gabi — I saw a few variations (maybe one in Saveur?) which called for cooknig the potatoes first, then grating. I imagine that would cut back the final cooking time a bit? Love the idea of the Vincer Rosti! Ham, egg, potatoes — what could be better? Why is the combination so good? This was dinner for about a week straight, and I never got sick of it. The creme fraiche or sour cream is key, too. Thanks! This is so beautiful, and I love the step-by-step photos. 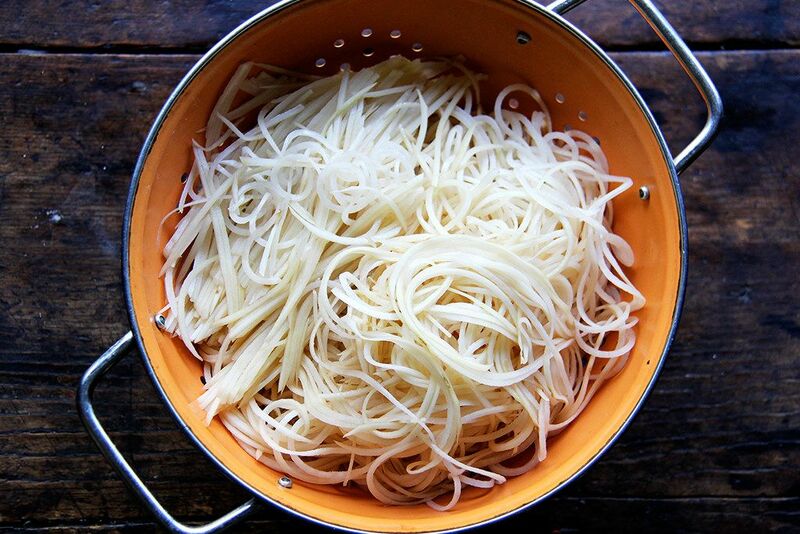 Potato capellini! Thank you, Merrill! 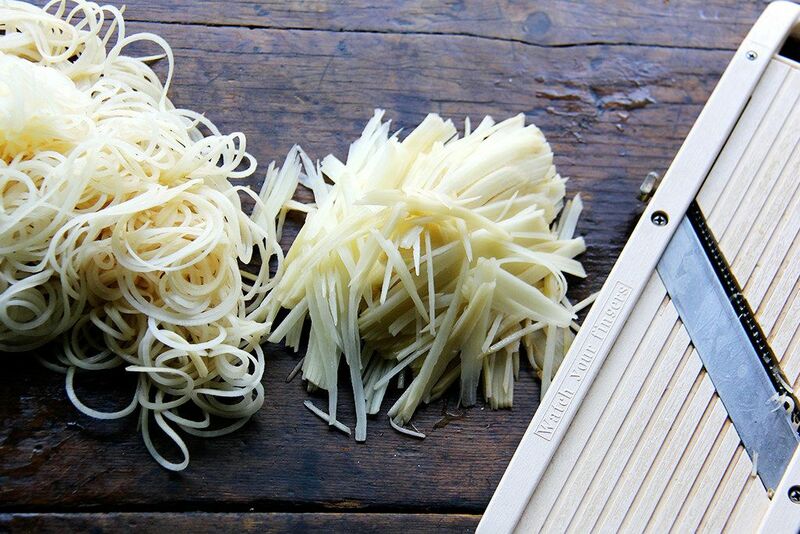 I think my turning slicer is one of my least-used gadgets, but I absolutely love using it — yes, potato capellini!